Her name is Ella. She has soft, light-brown to blondish hair that almost drops down over her hazel color eyes. Ah, those eyes. . . they stare at you as if they were always asking for your complete attention, if not your warm caress or embrace. Nobody ever loved so much nor deserved to be loved as much in return. If only she was not a dog! Ella is our family's ten-month old Johnson type female American bulldog who lives in our house 45 minutes away from our business office along with our other dogs. They faithfully stand guard over the house while we are away during much of the day. August 17, 2012 was the day I came home shocked at seeing Ella lying in our garage motionless. By the time I had parked, I was still expecting her to stand up, wiggle her buttocks and her tail and scamper to welcome us. Like she always had. But she remained still as a rug on the pavement. As I came closer, I noticed her body was totally jaundiced. My wife and I immediately decided to prepare our balcony and quarantine the ill dog. As if she was truly a part of our family, her limp body brought feelings of confusion and pity within me. I immediately called my vet; but it was past 6 P.M. already and she suggested we bring Ella early morning the next day. By 7 A.M. of the following day, my sister-in-law, Grace, brought Ella to our vet. At first glance, Dra. Besa found out that our dog had hepatitis for almost three weeks already and that she would not survive in her condition. The vet, however, suggested to try liver food supplement and to undertake a series of antibiotic treatment as a last resort. Even with my dogs, I do not trust antibiotics considering it was a liver problem. And from my own experiences and studies in alternative medicine, I knew somehow that there was another option other than the vet's prescriptions. I requested Grace to undertake a treatment program for Ella along with the positive attitude that she will survive the ordeal. Grace administered the treatment of 1 gram of chlorella every hour, either sublingually or behind the teeth to make sure the nutrients were properly ingested. It was not an easy procedure because if you made a mistake, chlorella might end up in the lungs and cause other problems. Around 4 P.M. the following day, Ella started attempting to stand and greeting us with her wiggling tail. When I saw that, my hope revived for, contrary to the vet's prognosis, she was showing great signs of recovery. Just the fact that she looked excited to see me told me she was well on her way to regaining her health back. Indeed, Ella started to eat a little rice and adobo with turmeric sprinkled on it. On August 20, three days after her ordeal, Ella became active and vibrant again. Today, she remains healthy and strong. My other ambull, Ello, and our other dogs regularly consume chlorella as part of their diet now. 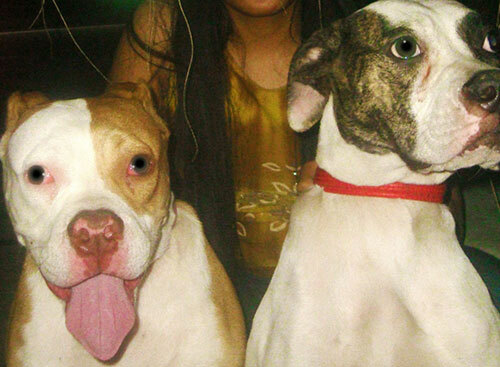 By the way, you probably know why we call our ambulls Ella and Ello. They don't look green; but they do love chlorella as much as our whole family does. CHLORELLA WORKS WITH HUMANS; SO, WHY NOT WITH PETS? After all, Dr. Bernard Jensen, in his book, “Chlorella, Green Gems of the Orient”, wrote that chlorella is “the best food for pets”. Food or medicine, one thing is certain: Chlorella will remain a permanent part of healthful living for our entire family – and that includes pets.